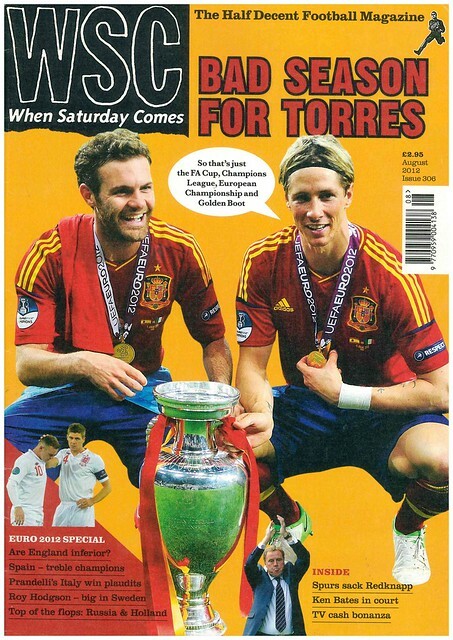 Joined by Juan Mata, Fernando Torres is the cover star of this month’s When Saturday Comes, looking back in a horrendous season for him that saw him become a European champion for club and country, top scorer in Euro 2012 and an FA Cup winner. 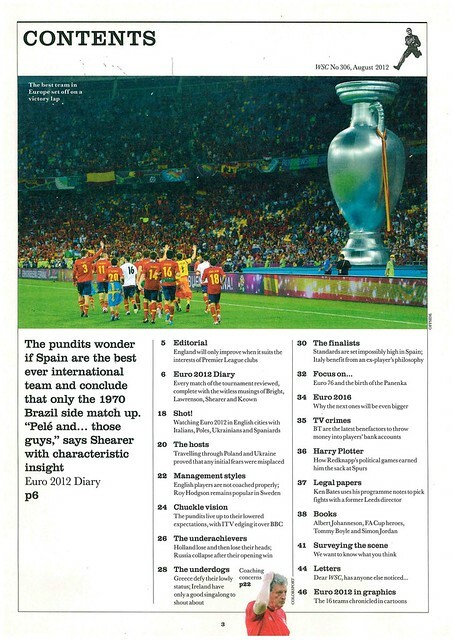 Euro 2012 dominates this edition, with a day by day diary of the competition, looking back at every game, including a photographic look at how fans watched the tournament in the UK, while there was a feature on those who did travel to Poland and Ukraine, where the welcome for travelling fans wasn’t as bad as feared. 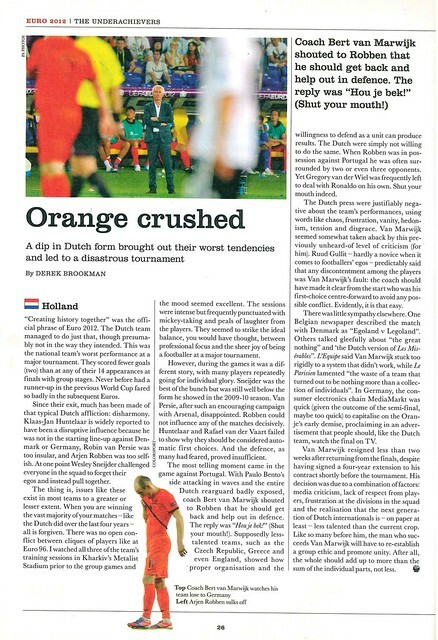 There is a look bad at some of the tournament’s failures, with group stage exiters Holland and Russia getting full page features on their failure. 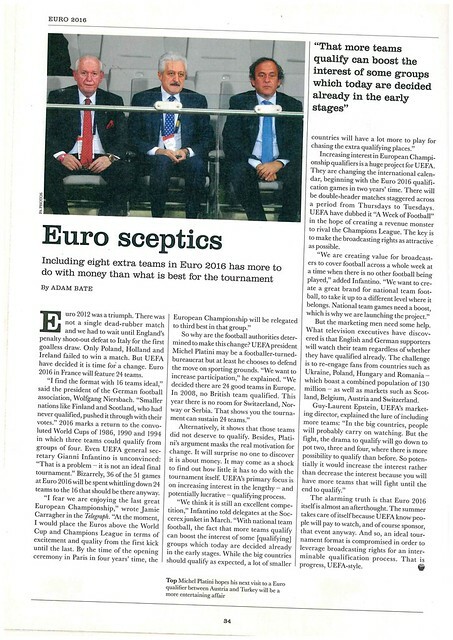 Underdogs get profiles, with Republic of Ireland and Greece getting a full page looking back at their respective fortunes, as did both finalists Spain and Italy. There is a look forward to Euro 2016, with sceptical analysis on the decision to increase the tournament from 16 teams to 24 teams. 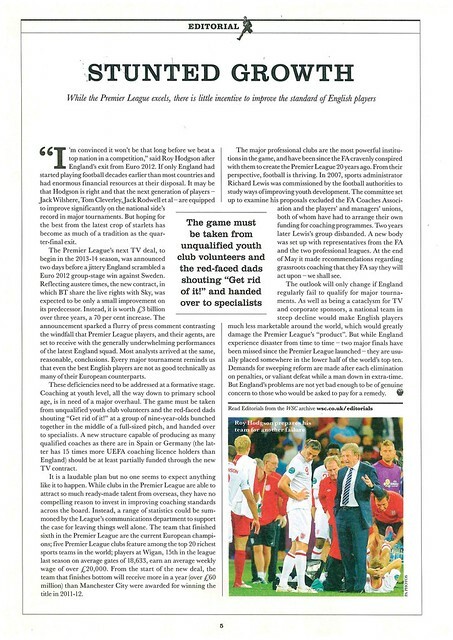 In club football, there is a look at Harry Redknapp’s sacking as Tottenham Hotspur manager, and the polarising nature of the reaction to his departure from fans and media. The previous two seasons for me began in Bray. Not this time, it was the Stade De France to begin 2016-2017 with the opening match of Euro 2016 between France and Romania. It was one of three Euro 2016 matches I attended, taking in Northern Ireland v Poland and Republic of Ireland v Sweden during my time in France. Back home, it was the earliest start ever to a Linfield season, June 30th, and a UEFA Cup tie against Cork City, where I attended the home leg at Windsor Park. June 2016 was a month that was dominated by Euro 2016. The early days of the month were spent chronicling a mural in East Belfast to commemorate Northern Ireland’s qualification, getting pictures of the final piece upon my return from France. Oh yes, I was in France. Wasn’t that fussed about France as a country, but loved the three matches (France v Romania, Northern Ireland v Poland, Republic of Ireland v Sweden) I was at. I also got some Street Art photos in Paris, and London, as I flew back from Gatwick due to there being no Paris-Belfast flights on a Tuesday. Not a lot else happened in the rest of the month. That was, until, the final, when I attended two Belsonic concerts. Belsonic? Yes, this year, it moved to June (though there were later concerts in August) and I went to see Elli Goulding and Stereophonics. And it was at a new venue, Titanic Belfast. There was even some domestic club football this month, as the last day of the month saw Linfield lose 1-0 at home to Cork City in the UEFA Cup. So, this was the match that I got in my ticket application. Who to support? Well, Ace Of Base are better than Westlife. As a bonus, i’d be getting to see Zlatan in the flesh in his current city, which he will be leaving this summer, unless he makes a sensational transfer to French second tier side Red Star. I’m not sure if it’s a tribute or just a natural thing, but the vast majority of Swedish men look like Zlatan. That is based on those that were at the Stade De France. Both teams arrived in France looking to improve on their recent European history. Republic of Ireland almost reached the Semi-Finals in 1988, but didn’t qualify again for 24 years, where they lost all three games. Sweden reached the Semi-Finals as hosts in 1992, but didn’t qualify for the next one. In the four tournaments since, they’ve been eliminated at the group stage in three of them. With Belgium and Italy in this group, qualifying automatically will be difficult. Both teams viewed the other as a match they can get points from as a springboard ahead of games against Belgium and Italy. For all the talk of Zlatan, it was Martin Olsson who was Sweden’s main man in the early moments, getting into crossing positions down the left hand side. Jeff Hendrick had Republic Of Ireland’s first attempt on goal when he forced Isaksson to tip his shot around the post. John O’Shea was soon frustrated when he couldn’t his foot onto a ball that was rolling across the penalty area. Robbie Brady joined the list of frustrated Irish players when his shot went just over. Republic Of Ireland were having the better of the play but having nothing to show for it. Hendrick was frustrated again, hitting the bar. Zlatan wasn’t having the best of afternoons. The ploy to stop him, stop the supply. If you can’t stop the supply, get as many players near him when he gets the ball. Simple, but effective. Like Poland, the day before, Republic Of Ireland made up for not getting a first-half goal when on top by getting an early second-half goal. Seamus Coleman crossed the ball, finding Wes Hoolahan who fired home. The goal, spurred Sweden into action, having a lot of pressure on the Irish goal. It looked inevitable that an equaliser would be only minutes away. Emil Forsberg should have had it when he fired wide from a corner. Despite riding out the initial Swedish storm, the shadow of Zlatan was still there, getting in front of his man to steal a few yards, but his volley went just wide. A few inches inside, we would have been talking about a top class goal. Zlatan then showed all he needs is a few yards when he got enough space to pull back a cross, which was headed into his own net by Ciaran Clark. Republic Of Ireland were deflated by that goal. They didn’t look like they would be able to go back in front again. They countered that by having enough about them to keep Sweden out. A match that both sides needed to win meandered to a draw. Defeats for both sides on Matchday 2 sees them both staring into the abyss, but both knowing that a win on Matchday 3 will offer them salvation. It will be a tough ask. According to Google, in order to get from Guadalajara in Mexico to Nice in France, it takes 15 hours and 55 minutes with a stop-off in Houston. The longest it will take, is 21 hours with stop-offs in Atlanta and Rome. Someone should have told the Northern Ireland team, it took them 30 years, to the day. Unsurprisingly, players and fans were determined to make up for lost time. Northern Ireland fans had been in the city for days in advance, befriending their Polish rivals. With some justification, he was the top scorer in qualification (equaling David Healy’s record from Euro 2008 with two less games played) as well as banging them in for Bayern Munich. Fans reached the stadium via a free Shuttle Bus from the City Centre, which left you off a 30 minute walk from the stadium. The scenery around the stadium was fantastic, some stunning views. The problem was, that’s all there was around the stadium. There wasn’t really much else. So, I headed into the ground as the weather in Nice was what meteorologists call Drinking In Botanic Weather. Unfortunately, vendors in the stadium ran out of stock of overpriced (€4 a bottle) bottled water. You’d think they might have foreseen this. The match kicked-off and Northern Ireland were nervous. They hadn’t been this nervous for a while. Poland had most of the possession and chances in the first-half. Michael McGovern was the Northern Ireland player who was getting the most touches of the ball. When Northern Ireland’s outfield players got the ball, there didn’t seem to be options to get it forward. It felt like a Polish goal was inevitible, but Northern Ireland managed to hold out to half-time with a 0-0 score. There was no way they would get away with another 45 minutes like this. Just when you were looking at milestone minutes to get to to aim to keep out the Poles, Poland took the lead early in the second-half when Arek Milik got enough space in the box to set himself up for a shot and fire home. It was as deserved for Poland as it was disappointing for Northern Ireland. Instead of trying to stay in the game, Northern Ireland were now aiming to get back into the game. It looked more likely that Poland would make it 2-0. As the game neared it’s end, Northern Ireland had a go. They had Poland worried, but not hanging on for life. Conor Washington looked like he was running through, but Poland’s keeper was straight out to deny him. Steven Davis got free from a low free-kick but lost his footing. Poland were able to hold out and get a vital win. Northern Ireland didn’t play awful, but they could have played so much better. Supporters left the stadium to find the Shuttle Bus back to Nice City Centre. They eventually found it after a 30 minute walk. Supporters queued up in a line which had no clear marking as to where the start was. Buses just stopped where they like. It was pot luck if it stopped near you. Buses were overcrowded. People were angry. Thankfully, it didn’t spill over. To make matters worse, there were no amenities for supporters. Nowhere to get a bottle of water or even somewhere to eat. It was an utter farce. The last time i’d seen scenes like this was trying to get back to Dublin from Slane after seeing Oasis in 2009. I eventually got onto a bus at 9.30pm, just over 90 minutes after the final whistle. That is nowhere near acceptable. Allianz Riviera is a brilliant stadium and Nice is a brilliant city, but you have to question the wisdom of making it a host city with such poor infrastructure. It is interesting to note that Nice is one of two (the other being Lille) Euro 2016 host cities that didn’t host games in France 98, with Nantes and Montpellier missing out this them. On the basis of this farce, they can feel hard done by at missing out. Fast forward four days, and the weather had changed to more Northern Ireland Weather by the game Northern Ireland faced Ukraine in Lyon. Feeling at home, they won 2-0. It games them a great chance of making the Second Round. They’ll get there if they can beat Germany. They might even get there as a best 3rd Placed team. We’re all mathematicians now. Poland was a false start, Ukraine was when Northern Ireland really got going. It just dawned on me that this was the 9th Northern Ireland match outside Northern Ireland that i’d been to (6 away, 3 neutral) and they had yet to win any of them. I’m considering surrendering my passport until 11th July. If you see me at an airport between now and 10th July, feel free to try and stop me boarding a plane. Hopefully, by this time next week, the Euro 2016 campaign will be still ongoing. The record books might say that Dimitri Payet scored the first winner of Euro 2016, but i’d like to think it was me, getting a €180 ticket to the opening game for €80. I was over for Northern Ireland’s match but was hoping to take in as many matches as possible. This was one of the games I was planning to turn up to and try and get a ticket for. I decided to leave it as late as possible, eventually being rewarded with a discount ticket half an hour before kick-off. I’m not sure if it was a good thing or not, but I was in the ground in time for the opening ceremony, getting to see David Guetta telling the crowd to wave their hands and make some noise. The French were up for it, but it was Hugo Lloris who had to make the first save of the game, saving point blank from Bogdan Stancu. It was all France after that, with both Giroud and Griezmann both missing headed chances. The French pressure then died down, with the crowd entertaining themselves by doing Mexican waves. Olivier Giroud then headed over again. Romania started the second-half as the team in control, and looked like they were going to make France pay for not taking any of their first-half chances. It looked perfectly set up for a 1-0 Romania win. Ironically, it was France who went 1-0 up, Olivier Giroud heading home from a cross. The crowd celebrated, their team would surely now storm home to victory. They got a shock when Romania got a penalty for a foul by Patrice Evra. They didn’t see it coming. Bogdan Stancu put the ball into the back of the net. It terms of execution and technique, it was a poor penalty. The keeper went the wrong way and the ball went in, so I guess it was a great penalty. France were stunned and needed inspiration. They turned to Coman and Martial off the bench. The second goal wouldn’t come. It looked like they would be fluffing their lines on their big night. On 89 minutes, Dimitri Payet swung his left foot on the ball which flew into the back of the net. The fans went wild and everyone went home happy. Everyone that is, except the Romania fans, who went home as devastated as the Touts outside the ground who were practically giving tickets away as kick-off neared. This was a trip i’d been waiting a long time for. In fact, probably since 2010, when it was announced that France would be hosting Euro 2016. I’d be going regardless even if Northern Ireland didn’t qualify. I’d never been to France before. In fact, i’d barely been to Mainland Europe. Subconsciously perhaps, i’d been saving my first French trip for this. To get to France from Northern Ireland, there were only really three options, with direct flights to Bordeaux, Nice and Paris, though a route to Lyon was added earlier this year. When the schedule of the tournament was announced, Paris was a no-brainer. The first four days of the tournament would see two games in Paris, one in Lens and one in Lille. Lille and Lens are both one hour away from Paris. Last summer, there was an open draw for neutral tickets. I applied for a game in Lens on 11th June, a game in Lille on 12th June and a game in Paris on 13th June. I sat eating my lunch one day last summer, when an e-mail came through from UEFA. The Subject Box said my application was Partially Successful. I sat staring at it, trying to make sense of it. Partially Successful?, that means i’ve got a ticket for at least one match. I opened the e-mail to check that was the case. Monday 13th June 2016, 1800 hours, Stade De France, E3 v E4. I had a ticket for this match. I didn’t know who I would be seeing, but I would be going to a match at Euro 2016. On the day the flights went on sale, I jumped in and got a bargain. I’d be going out on Thursday 8th and returning back on Tuesday 14th. With no flights from Paris to Belfast on a Tuesday, I booked to return back by London. An evening flight, spend the day in London. Might as well make the most of it. The day of the draw came, and I had written down what every game would be, and where. I knew where C1 would be playing, I knew where F4 would be playing. My eyes were on E3 and E4. There were two games I didn’t want. A Saturday night game in Marseille or a Sunday teatime game in Nice. I had taken a gamble. If Northern Ireland were in Group F, i’d be flying back on the day they play their first game. Northern Ireland came out in Group C. If it was C2, it was a Sunday night in Lille, and a 50,000 capacity stadium. C3 or C4, and it was the game in Nice, a 6 hour train journey away from Paris. I couldn’t believe, the one game I didn’t want, and Northern Ireland got it. My group came out, Group E, and it was Republic Of Ireland, and they were E3, the game I would be going to. This was like an episode of Give My Head Peace. It would turn out that Republic Of Ireland would be playing Sweden. I consoled myself with the fact i’d be getting to see Zlatan in the flesh. I had resigned myself that i’d have to settle for watching Northern Ireland v Poland in a pub in Paris. Only briefly, I decided that I was going to Nice. This was too big to miss. I booked the last hotel room, and began to look at trains. Nine months after booking the trip, the big day arrived. It felt like it would never come. I was even tempted to do that Facebook cliche of tagging myself as being in The Lagan Bar. During that nine month period, a Francophile friend had been giving my advice and some key phrases. The one word i’d be hearing and saying most over the weekend would be billet, which means ticket. My first billet, would be from Charles De Gaulle Airport to Gare Du Nord. Even though it was peak commuter time, we were squashed in on the train, with barely any room to put my luggage. It just seemed logical to me that a train serving the airport should have luggage storage facilities. The French must travel light. As I got off at Gare Du Nord, I began to follow the directions to my accommodation, to find the Rue it was on. That’s French for street by the way. I had taxi drivers shouting at me to give them my custom, giving me sob stories about how they need work in these tough times, before quoting me €45 for a journey that is no more than ten minutes. They didn’t really grasp the correlation. I decided to walk it. I found my accommodation, after navigating streets filled with binbags piling up and having to dodge smokers at a rate which is worse than Belfast, an impressive feat considering that Belfast City Centre is a smoke riddled shithole. I have to say, this wasn’t the best first impression of Paris. I then decided to have a walk around Paris and my impression got better. I checked out some Street Art on shutters. It was late enough for shops to be closed, but still daylight, a perfect combination. I had planned to do a Street Art Tour but I wasn’t able to commit to the time (it only left on a Saturday morning, and I wasn’t sure if my Saturday morning would be in Paris or Lens), preferring to stumble upon pieces. Friday was spent wandering around Paris. I bought myself an all day Metro ticket. I had a brief visit to Parc Des Princes to see what it was like, but it was heavily cordoned off. From there, I headed to the Saint Germain region, having a look around the shops. A lot of the shops were very high end clothes stores that would attract the likes of France’s suavest men such as Francois Mitchele and Jacques Fullerton. Friday night was the opening game of Euro 2016, France v Romania. The cheapest ticket for this was three figures. I decided to head to Stade De France to take in the atmosphere and try to pick up a cheap ticket. The fact that tickets were still on general sale on the day of the game suggested this could be a Buyer’s Market the closer you got to kick-off. I was planning to wait until 8.45pm (kick-off was at 9pm) before trying and would go no higher than €60. This wasn’t the game I headed out for, it would be no loss to me. I could find a pub and watch it there. At around 8.30pm, I got approached by a tout (the fact I was milling about was probably a giveaway) who offered me a €195 ticket for €150. I said €60 and we settled on €80. For the extra €20, I was getting in the ground earlier and ensuring I would see all of the game. Not only did I get to see all of the game, I was even in the ground in time for the opening ceremony. I’m not sure if that was a good or a bad thing, getting to witness David Guetta telling people to make some noise and wave their hands. What a showman. France won the match 2-1, and everyone went home happy. Especially me, who discovered a shortcut to my accommodation from Gare Du Nord, and some Street Art within the station. Saturday’s original plan was to go to Lens to try and get a ticket for Albania v Switzerland. Upon seeing that it would cost €70 for a one hour journey, I decided against it. Especially disappointing as SNCF had promised special discount prices for fans travelling to and from Paris. I then walked around Paris some more, finding myself in an area called Le Republique, as well as stumbling upon some Street Art around the back of Gare Du Nord. I had planned to watch Slovakia v Wales in the Fanzone at the Eiffel Tower, but I took a wrong turn on the RER and missed it totally. Saturday night was spent watching the first-half of England v Russia and having a bite to eat before heading for an early night. The reason why I was having a early night, is because I needed to be up early to get a 0720 train to Nice. I thought i’d be the only one on the train, but it was packed, mostly Northern Ireland fans. I found my hotel in Nice and checked in, relaxing for a bit before heading to the stadium. The only way to get to the stadium was via a free shuttle bus from the City Centre, which dropped fans off a thirty minute walk from the ground. The match I was in Nice for, was Northern Ireland v Poland. The stadium was fantastic, as was the scenery around it. The problem was, there was nothing else around the ground. The match itself was a disappointing 1-0 defeat for Northern Ireland. Afterwards, I headed to get my bus back to the City Centre. What I saw, was utter chaos. There was a line of people, but no queue. Basically, the bus parked wherever it liked, meaning it was pure luck if you were able to get onto a bus, a bus which was usually filled over capacity. The match finished just before 8pm, and I didn’t get onto a City Centre bound bus until 9.30pm. There were still a lot of people waiting for a bus when I got mine. It really ruined my plans for the evening. I’d planned on being in the City Centre by 9pm and watching a bit of the Germany v Ukraine match. When I booked a hotel room in Nice, the plan was to head back to Paris the next morning. Due to the extortionate prices, I got on an earlier train just after midnight. Even though I wouldn’t be sleeping in Nice, I still got value out of the room as it allowed me to drop my stuff off, relax, and get showered ahead of my train journey. From what I saw of Nice, it looks like a city I would love to visit in full one day. There is the potential of some decent sport watching, with OGC Nice in France’s top flight, with Monaco nearby, as well as Toulon in Top 14 Rugby. Back in Paris, and a wee lie-in on the Monday, it was to the Stade De France to see Republic Of Ireland v Sweden, before getting something to eat, and then beginning to pack up, ahead of an early morning Eurostar to London. To be honest, I wasn’t that impressed with France. I found Paris to be filthy, the public transport to be incompetent (The time of my train out of Nice was put back by twenty minutes without being told), police and stewards to be power crazed, and taxis to be a rip-off. I won’t be rushing back, but don’t rule it out maybe one day. It’s a pity, as there is the potential for a decent Football Weekend in Paris to be had, with PSG and Red Star, as well as Lille, Lens, Amiens, Reims nearby. So Tuesday, was spent in London, as I flew back from there. I’ve been to London before, so I knew where I wanted to go to, especially with only a day on my hands. I headed to Camden, taking in Camden Market and getting some Street Art photos, before heading to Soho, to visit a shop called Vintage Magazine Shop, which is as it says. I had a look around but found it too expensive for my liking, for someone who considers themselves a hobbyist rather than a collector. On that note, I can exclusively reveal that there will be a new series of The Magazine Archive in January 2017. Keep an eye out for that. It’s still a shop worth visiting, but I wouldn’t consider buying anything there. I’ll stick to rummaging for bargains in Empire Exchange whenever i’m in Manchester. I’d planned to go to Shoreditch, but a monsoon stopped that plan. With my flight at 8.10pm, I decided to go the the airport early to check-in so I could watch Austria v Hungary (kick-off at 5pm) while getting something to eat. A strike in France meant that Easyjet wouldn’t allow me to check-in until 6.10pm. Even though I was no longer in France, they were still managing to ruin my plans. I’ve never seen a more incompetent country. To add to that, the hotel in Nice that cancelled my booking last December as they had no rooms, meaning I had to book another hotel, charged me for staying there. I’m currently getting that sorted by Booking.com. The French way, seems to be going on strike and doing things half-assed. I loved going to the matches, but didn’t really enjoy being in France. I would have loved to have stayed a few extra days though, if only to see Northern Ireland v Ukraine, and James in concert in Paris. The only concerts on in Paris when I was there were Iron Maiden and Adele, neither who i’m fussy about. Despite that, i’m looking forward to going to Euro 2020. Hopefully. That tournament will be played all over Europe. The games that interest me are the ones at Hampden Park and Lansdowne Road. Hopefully, the Scots and/or Irish will be slightly more organised than the French. You’ve got to feel for David Healy. He’s has not one, but two murals of him in East Belfast painted over. I guess he’ll have to make do with three points every time he visits the East of the city. There was a mural of his goal against England in 2005 on Montrose Street South. Following the death of David Ervine, Healy’s mural was painted over, and replaced by one of David Ervine. To compensate for Healy’s mural being painted over, a new one of his goal against England was painted across the road in Carnforth Street, albeit from a different angle. To use a football analogy, the mural had seen better days and was heading towards retirement. It had fallen into disrepair. It needed replacing. If only there was some sort of football event this summer that Northern Ireland were competing in. In late May, the mural had gone and was replaced by a blank wallspace, with it being teased that it was going to be replaced by something to represent Northern Ireland’s qualification for the European Championship. By early June, a new mural was progressing, painted by local artist John Stewart. The image took around four days to do, but unfortunately it wasn’t completed in time before I headed to France. Upon my return from Fance, naturally, I headed out to get some photos of the finished piece. Hopefully, there’ll be wallspace in Belfast and across Northern Ireland being filled with images of carrying the European Championship trophy around the Stade De France on July 10th. Need to get a win against Ukraine first. I hope you’ve enjoyed the month by month look at the 2015-2016 season just past. The 2016-2017 is only a matter of days away. Scary, I know. Before I wrap up the 2015-2016, it’s time for my favourite photos. Hopefully, you’ll agree. Feel free to vote for your favourite. Taken at my very first game, back on 27th June 2015, I like the composition and framing of this. Taken at Ballinamallard in September. I don’t know why I love this photo, I just do. I was taking a photo of the corner, but this guy just got up and started to encourage Linfield players, which made the photo for me. A photo of just the corner kick would actually have been boring. Taken on that famous night against Greece just after Davis first goal, and trying to capture what it meant. No filtering or magic tricks, that’s what the sky was like when Linfield travelled to Ballymena in December. Just had to get a snap. Taken after the Irish Cup tie at Solitude in March, what it means to win at a ground you haven’t won for four years, and to do so in a convincing manner. Taken at Dalymount Park, terracing that isn’t used anymore, other than to hang flags on. I like the composition of this.